Chop the onion,coriander and chillies finely. Mix together in a bowl onions and coriander leaves. 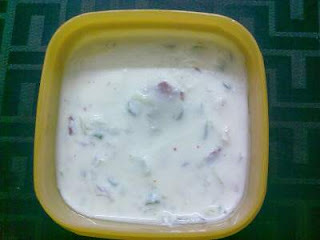 Chill the curd in the refrigerator. Now add the chilled curd over the above mix. Finally add jeera powder and mix well.I prefer making the powder at home by roasting the jeera.